hen I was first asked to write this article by Restaurant Insider, I didn’t know how to approach it. So, I am going to start at the beginning and hopefully by the end, you’ll understand what drives my passion. On December 3rd 1999, my wife Jennifer gave birth to our beautiful son, Sean Thomas. He had all ten fingers and toes and was a healthy new born baby boy. Just after his birth, he received his first shots – the ones that are supposed to protect him against illness. Everything seemed great for the first month of his life. He slept, ate and pooped on cue. Then, he became colic. For the next four months, he cried nonstop. We were exhausted. Then he started developing ear aches. We consulted our pediatrician, who advised us that antibiotics would be best for our child. Sean ran high fevers, yet we were encouraged to continue with his vaccinations because we were assured that they would protect him. At about 18 months of age, just after the MMR vaccination, we started to realize Sean was a little different. He slowly stopped talking, played by himself, ignored us and repeatedly ran back and forth to the door. His stools began to change, his eating habits too. We had his hearing checked because he was acting out and ignoring us, but the tests came back normal. So we took Sean for a neurological examination. It was then that we received the news that our son might be PDD NOS. We were instructed to have our school district give him an early intervention. When we got home, we looked up PDD NOS and discovered that it stood for Pervasive Developmental Disorder Not Otherwise Specified. As we delved further, the words Autism Spectrum Disorder started appearing next to it. At the age of two, our pride and joy and the love of our lives had slipped through our fingers into a world his own. Sean has always been affectionate - something that is not always associated with autism - but everything else was slipping, and slipping fast. As the years progressed, Sean’s stomach got worse and worse as did his behavior. He would stay up all night long and scream in pain. We went to doctors, had colonoscopies performed, spent hundreds of thousands of dollars. We tried everything to help our son, but nothing worked. Sean had accidents constantly. We ripped up rugs and replaced them with hard wood floors, before moving on to vinyl. He couldn’t digest anything, and he continued to lose weight; he was sick, very sick. As a chef, I tried making him food that he could digest, but he wasn’t able to. I could cook for others, win awards and accolades, but I couldn’t cook for my own son. It was extremely frustrating and worse, very saddening. Today my son is doing much better thanks to a new biomedical approach we are taking with him. He is no longer on traditional medications, and he is speaking more, interacting with his brother, and behaving better. After seven years he is finally out of diapers. Sean is the reason and the catalyst that drove me to create AUTISM SPEAKS TO WALL STREET, A CELEBRITY CHEF GALA. Currently, 1 in 150 children are diagnosed with Autism; 1 in 94 boys. This number is higher than juvenile diabetes, cancer and aids combined. When my son was diagnosed, I knew that I had to try and stop it and help to find a cure. One of my hopes was that by writing this article, I could encourage others to create or support charities. To create a charity, and really stand behind it, you have to be personally vested. To start an event from scratch is a lot like building a restaurant. You believe in what you are doing, and you think people will come, but you really aren’t sure. There are ups and downs; sponsors who will back out, chefs who commit to the event one day and then back out the next. It’s challenging to say the very least. But, if you believe in it the same way you believe in your restaurant, it will work. I did not start Autism Speaks, Bob and Suzanne Wright did. Thank God too, because without Autism Speaks, our children would continue to live in a world unknown to the rest of us. Bob and Suzanne began Autism Speaks when their grandson Christian was diagnosed with Autism. As Vice Chairman of General Electric and former CEO of NBC Universal, Bob Wright is well connected and able to get the word out. The mission of their organization is to aggressively fund global biomedical research into the causes, prevention, treatments and cure for autism. Autism Speaks recently celebrated the announcement of a World Autism Awareness Day through the United Nations to be celebrated each year beginning on April 2, 2008. They played a vital, behind-the-scenes role advising and assisting the Qatar Mission in sponsoring the resolution to make a World Autism Awareness Day possible. Prior to the Wrights, no one had really heard of autism. I was delighted to align my event with such an esteemed charity. Autism Speaks to Wall Street attracted many of the culinary world’s top talent. It was a virtual who’s who of the Chef world. Eric Ripert, Wylie Dufresne, Dan Barber and Andrew Carmellini signed on right away. They came from near; NYC’s own Shea Galante, Chris Lee, and Terrance Brennan, and far; Gunter Seeger and Shaun Doty from Atlanta, Tory Miller from Madison, WI and Jose Garces from Philadelphia. Paul Liebrandt, Bradford Thompson and George Mendes participated even though they didn’t have a restaurant. As with any undertaking of this scale, we were faced with certain logistical challenges. One of the biggest problems we ran into while in the planning stages entailed finding a sponsor to provide us with ovens. The idea was to have our chef’s cook tableside for guests which I believe would set us apart and distinguish our gala as one of the most unique events NYC has ever seen. We tried everyone, but it was either too short notice or beyond their budget. Finally, PC Richard’s agreed to sell us LG ranges at cost. We opted to buy 24 ovens and have some of the chefs share. The ovens were brand new and had to be wired. They were delivered to Capitale at 6 am in the morning the day of the event. The electricians spent over 10 hours wiring the ovens to a generator that was parked outside. Problem solved! In the end the evening was a smashing success, raising $1.1 million for research into the treatment and cure of Autism. All the chefs loved it, as well as all of the guests who were treated to 4 courses prepared especially for them. After dinner, spectacular desserts were created by a literal who’s who of the pastry world; Francois Payard, Michael Laiskonis, Karen Demasco, Will Goldfarb and Sam Mason to name just a few. Lisa Loeb performed a few of her hit songs and Zero Gravity, a thrilling acrobatic team, opened the evening. The night was simply magical. Next year, we hope to attract even more chefs from all over the world, like Ferran Adria, Joel Robuchon, Gordon Ramsay. We hope to demonstrate that autism is a global concern affecting millions of people everywhere. I’d like to thank all the chefs who donated their time for our first year, and I hope you will come back again. And to all those who want to participate next year, I welcome you. Together, we have a chance at finding a treatment and cure for this devastating and heartbreaking disorder. 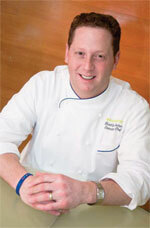 Franklin Becker is currently Executive Chef at Brasserie in New York City. Look for Chef Becker’s new cookbook in 2008 - all proceeds will be earmarked for autism biomedical research.